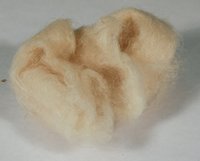 Our online store now has Degummed Hemp Fiber in stock. This Hemp Fiber is nothing short of amazing wicking material. It wicks well, flavor is awesome, and it lasts a really long time. It is very easy to use as well. A bag of this should make many, many wicks for your RBAs and RDAs. Hemp Fiber can be used in the same manner as organic cotton for wicking. Slide a piece through your coil or wrap your coil in it. It works amazingly well in EVODS and Protanks with a vertical microcoil by surrounding the coil with hemp fiber. A coil set up in this manner with hemp fiber can last for weeks or even months! There is a slight earthy flavor to hemp fiber that usually goes away by the first 1/2 tank of e-liquid run through it. Boiling and drying the fiber prior to use helps to remove the earthy flavor, but it may not even be necessary.